Everyone has an opinion on the Gujarat elections — political pundits have come up with their predictions, exit polls have conducted scientific surveys, and the average man on the street too has a passionate take. But an Indian startup says it has crunched its social media data to predict what the election results are going to be like. ShareChat says that based on the usage stats on its app, the BJP was more popular then the Congress in the days leading up to the polls in Gujarat. Not only were more posts relating to the BJP created on its platform, the tone of the posts was more positive too. Posts relating to the BJP were viewed nearly 70 lakh times on its app, while posts relating to the Congress were viewed only 40 lakh times. 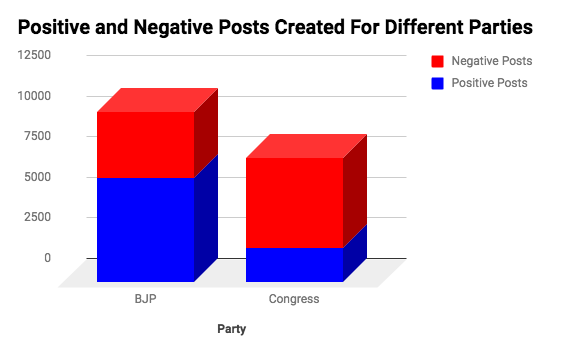 More than half of BJP-related posts talked about the party in a positive light, while a large majority of posts relating to the Congress were negative. ShareChat is uniquely positioned to attempt to sense the mood of Gujarat as it goes into polls. The app lets people share and view all kinds of content, and has over 10 million downloads. ShareChat focuses on vernacular languages, which means it is popular among millions of people in the Indian heartland. Most significantly, ShareChat had correctly predicted results of the UP elections earlier this year, maintaining before the polls that based on its usage, BJP had a significant advantage over other parties. BJP had eventually stunned political observers by winning a historic majority. 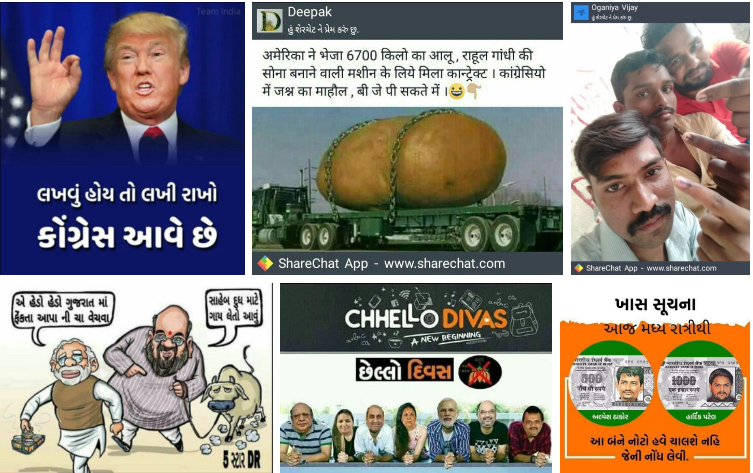 ShareChat says it had created special hashtags in Gujarati before the elections, encouraging its users to share content around them. “Users opened the BJP tag 166525 times, the Congress 111215 times. The tags of the top two leaders of BJP and Congress, vis a vis Narendra Modi and Rahul Gandhi, were opened 77112 & 29220 times respectively,” says ShareChat. “This helps us to gauge a general interest of the public in the parties and their leaders,” it adds. Among party leaders, ShareChat found that Narendra Modi was head and shoulders above the competition. Not only were the most posts created about the Prime Minister, a large fraction of them were positive. 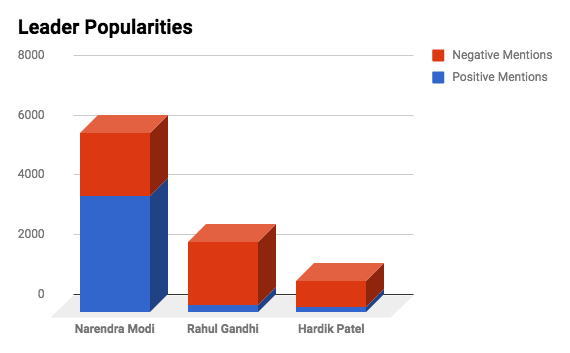 The vast majority of posts that were about Congress President Rahul Gandhi and Patel leader Hardik Patel were negative. ShareChat doesn’t claim its analysis is as scientific as the polls done by professional psephologists, but social networks now have disproportionate access to how the average citizens thinks and behaves. Facebook has been widely criticized for its role in the US election, where Russian operatives were allegedly able to buy advertisements on its platforms that were designed to influence the election. ShareChat, too, thanks to its reach in the Indian heartland, could have its finger on the pulse of the average Indian voter. 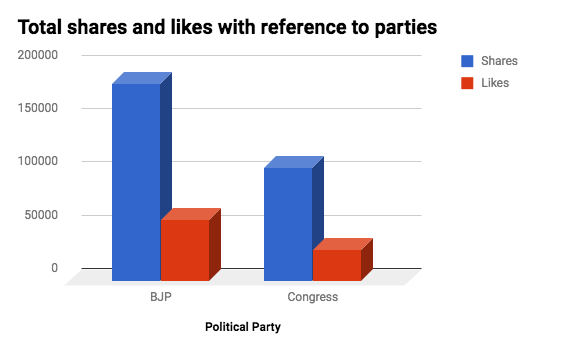 While the official results of the election are due tomorrow, both exit polls and social networks seem to indicate that the BJP is in the drivers’ seat.